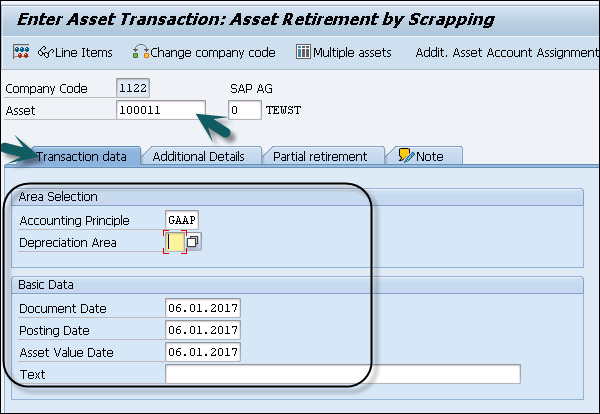 In SAP Asset Accounting, it is required to remove an asset partially or completely from asset portfolio. This is called asset retirement or asset scrapping. When you sell an asset, it results in revenue being earned. The sale is posted with a customer. When an asset is sold, it results in revenue being earned. This is posted against clearing account. You scrap an asset with no revenue earned. When an asset is sold to an affiliated company. 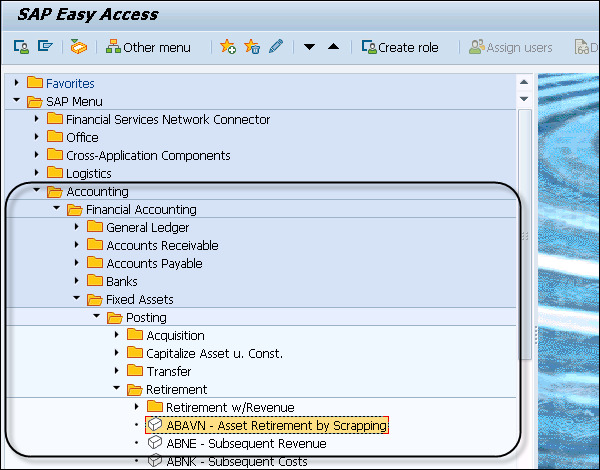 Step 1 − To perform a partial scrapping in Asset Accounting, navigate to Accounting → Financial Accounting → Fixed Assets → Posting → Retirement → Asset Retirement by Scrapping. Step 2 − Enter the Company Code and click the Continue button. 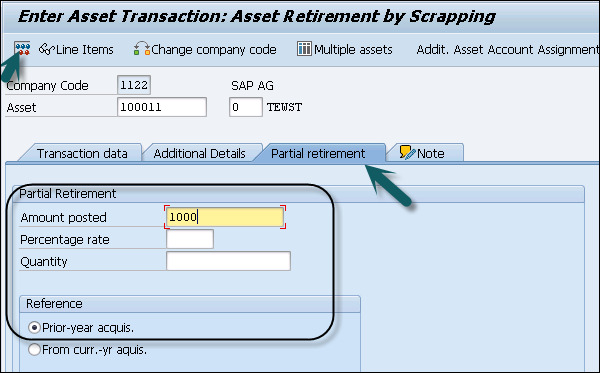 You can also start the transaction ABAVN – Asset Retirement by Scrapping, double-click it. Enter GAAP in the Accounting Principle box (U1). Enter today’s date +1 month in the Document Date box. Enter today’s date +1 month in the Posting Date box. Enter today’s date +1 month in the Asset Value Date box. Step 3 − Click the Partial retirement tab to select it. In the next window, enter Amount Posted and From curr.-yr aquis.. check box and click the Simulate button. When you use scrapping, it decreases APC value by the amount entered minus deprecation calculated. 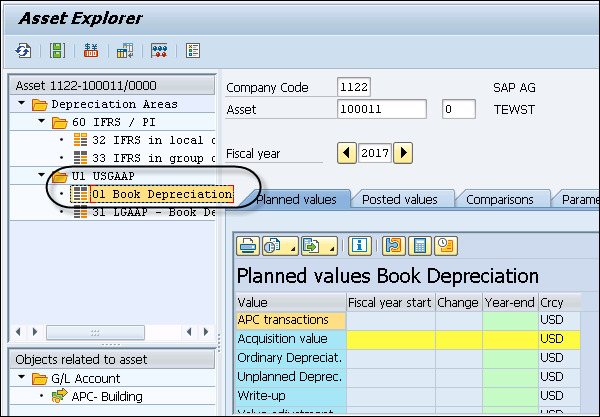 In this, Only GAAP is selectable as the document is only posted to the OL ledger and the other ledgers get no update. Step 4 − To post, click the Save button. Step 5 − To view the result, start the Transaction AW01N – Asset Explorerby doubleclicking it.